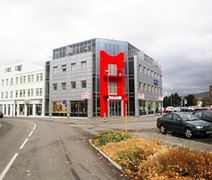 Office Space - Akureyri, . This modern centre features numerous stylish office-spaces that arrive fully furnished and have great access to a multitude of useful professional services including; air-conditioning, break-out rooms, lounge areas, meeting rooms, CCTV and copy & printing facilities. The spaces are also accessible 24-hours a day and maintain good levels of natural light throughout the day. A professional reception desk and on-site administrative support team are also available to assist your business as it develops. The building is well situated with close links to the international airport, making it an ideal location for a business hoping to maintain global relationships and networks. Surrounding the centre are a host of local amenities including restaurants, retail outlets and cafeterias.